Using the fastest and easiest pizza dough ever, you can whip up these tasty BBQ Chicken Calzones in no time! Have you stumbled across my recipe for Fast and Easy Pizza Dough yet? Everybody seems to love it because it is literally the fastest and easiest homemade pizza dough that you can possibly make! It’s ready in 15 minutes, and has produced some of the tastiest pizzas I’ve made to date! Because I love the dough so much, I decided I’d try and find other purposes for it. What better way than to use it for these tasty BBQ Chicken Calzones that are just oozing with goodness? You will start by prepping the dough, which like I said, is literally ready in 15 minutes. It’ll take you about 5 minutes to make the dough, and then you will need to let it rest for 10 minutes. While it’s resting, you will combine all of the ingredients for the calzone filling! All you’ll need is some shredded cheese (use whatever you have on hand, I used mozzarella, provolone, and parmesan because I had them all in the fridge), cooked chicken (I took a little help from the store and used rotisserie chicken), and some seasonings. I used a combo of Italian seasoning, garlic powder, parsley, and a little red pepper flake. Additionally, you’ll need some ricotta cheese. If you’re looking for a healthier alternative to ricotta, try using plain non-fat Greek yogurt, which is what I used with great success. To the mix you’ll add in an egg, and stir well! Now it’s time to make the calzones! If you’ve never made calzones before, the process is really simple. Divide the pizza dough into 4 equal pieces, and roll each piece so that it’s very thin! 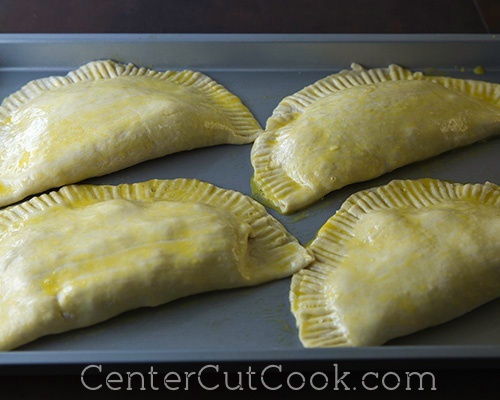 Divide the filling mixture evenly among the 4 calzones, placing the filling along half of it. Leave a little room along the edges. Dip your finger in water and run your finger along the edge of the dough so that when you fold the dough over, it seals well. Pinch the dough together to ensure that the calzone is closed tightly. If you want to get fancy, take a fork and press it around the edges to get the look you see below. This part is totally optional, but it does look fancy, doesn’t it? Spray a rimmed baking sheet with non-stick cooking spray and arrange the calzones on the sheet. Lightly whisk an egg, then use a brush to coat each of the calzones with a little egg. This will help them brown nicely in the oven. Pop then into a 400 degree oven for about 15 minutes, or until the calzones are golden brown and beautiful! 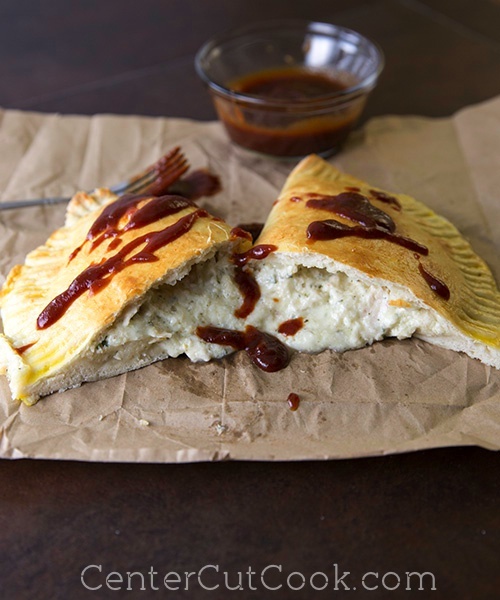 Serve with BBQ sauce on the side, or drizzle bbq sauce on the top of each calzone, whichever you prefer. You will be able to get 4 large calzones out of one batch of pizza dough. Feel free to change up the filling any way you like! Sometimes I make calzones with Italian Sausage that I’ve browned, other times I add veggies to the mix. The options are endless! Feel free to stir in whatever toppings you’d like. If you take the more traditional route, you’ll want to serve marinara alongside in place of the bbq sauce. Enjoy! While the dough is resting, combine the ingredients for the calzone filling. In a bowl, stir together cooked chicken, ricotta cheese (or plain non-fat greek yogurt like I used), parmesan cheese, mozzarella cheese, Italian seasoning, garlic powder, red pepper flake, salt, parsley, and black pepper. Add in an egg and stir to combine. Divide pizza dough into 4 equal pieces, sprinkle a little flour on your work surface and roll each piece of dough out so that it is very thin in the shape of a circle. 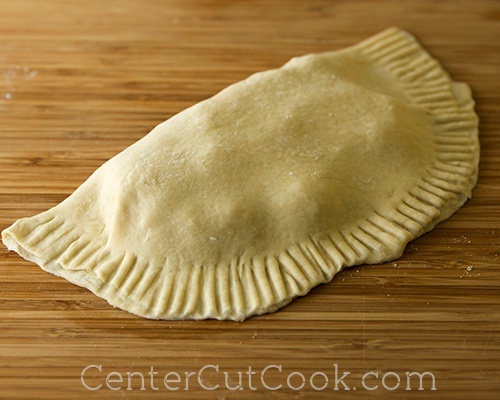 Divide the filling mixture evenly among the four calzones, placing the filling only along half of the dough. Dip your finger in water and run it along the edge of the dough. Fold the dough over the filling and press the edges to seal it. Use a fork to make marks along the dough if you wish. Spray a rimmed baking sheet with non-stick cooking spray and arrange the calzones on it. Lightly beat an egg. 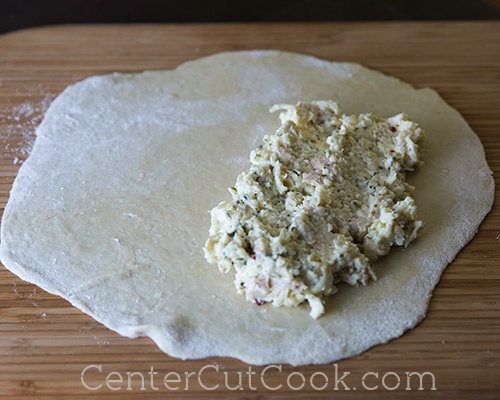 Use a pastry brush to spread each calzone with egg. This will help the calzones brown nicely. Place the tray in the oven and bake for 15 minutes, or until the tops of the calzones are golden brown. 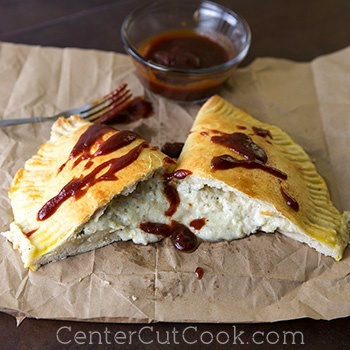 Drizzle BBQ sauce over the top of each calzone, or serve it on the side. Please remember that all images shown here are copyrighted and may not be used without written permission from CenterCutCook.